Miandam valley is best reprehensive of moist temperate forest geographically located 35, 02 N and 72, 33 E. The valley has over 300 plant species of which majority plants species are reported to be medicinal. The local community prepares medicines from these species through traditional way by using their indigenous knowledge for curing variety of disease. Decrease in medicinal plants has been observed in the last 30 years due to various threats and issues. Deforestation has been reported the main threat behind the declining trends of medicinal plants. The results shows that due to external pressures many plant species have been found endangered, rare and vulnerable. A high deforestation rate of 2% per year has been recorded over the last 30 years. Each year 8,053 trees are cutting in the valley for domestic and commercial consumption which is more than the actual yield provided by working circles and outside working circles areas. 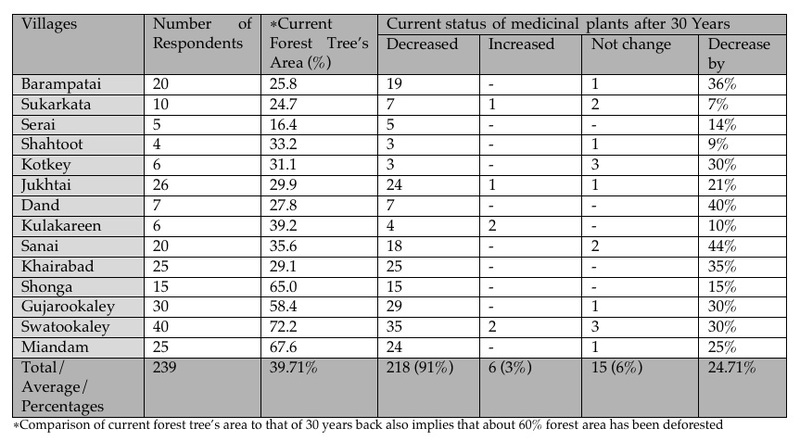 Current deforestation rate is leading towards substantial decrease in medicinal plant's wild production and hence can affect ethno-medicinal uses and the socio-economic condition of the associated people. It is necessary to find out ways and means for effective domestic and commercial uses of medicinal plants to ensure its sustainability. Earlier, medicinal plants were obtained from the forests. At that time in the forests they were in abundance and the consumption was in milligrams or grams. But now, the situation has reversed due to deforestation, uprooting of the plants for fulfilling the requirements and the craze for herbal globalization. So the medicinal plants have become endangered. Therefore, the rates have also increased and are unable to fulfill the requirement of the genuine material in the world. People living in the mountainous ranges of Pakistani Himalayas, Hindukush and Karakuram are greatly dependent on medicinal plants for variety of uses. It proved to be a good income source and cheep source of curing diseases at local level. Currently medicinal plants are under severe threat of extinction due to rapid deforestation, over and improper collection, over grazing etc. The present study is an effort to analyze the current status of medicinal plants in the context of its value for the local people of Miandam valley, District Swat, NWFP-Pakistan. Miandam valley (Miandam watershed) is a 70km2 area and best representative of moist temperate forests. The valley is a beautiful summer resort about 56 km from Saidu Sharif, the capital of Swat with an altitude of about 2000 m. Most of the area is mountainous belonging to the Hindu Raj series of the Hindu Kush region. Geographically, the area can be traced on 35, 02 N and 72, 33 E. Total area of Miandam valley is 6,949 ha of which 638 ha is irrigated agricultural area, 1,081 ha un-irrigated agricultural area, 4,388 ha are under forest and 842 ha other area. The watershed of Miandam valley having 4388 ha forest area is the biggest watershed of Miandam Planning unit of District Swat Forest range. The forest area of Miandam watershed is having 25 compartments active with three working circles i.e. 2621 ha of timber production working circle, 460 ha of conservation working circle and 1307 ha of community use working circle. Most of the forest area has been covered by more than 10% conifer forests. The study was conducted between the months of July and October. In the first month available literature was reviewed, relevant line departments and organizations were visited, and questionnaires were developed. Questionnaires were of two types i.e. for plants survey and social survey. Data was collected in the second and third month. In this regard individual and group meetings were held to gather information from the representatives of 10% of total 2,380 households of the valley. Group data was collected through random sampling by interviewing 250 respondents from different walks of life. Individual questionnaires were filled from 50 locals selected on the basis of their knowledge regarding people, plants and their uses. They were plant collectors, hakeems, shopkeepers, elders and plant traders. PRA technique was used in five villages out of 14 for documentation of different practices regarding deforestation and agriculture of the area. Track visits in mountain were exercised for the documentation of medicinal plants. Lastly the collected data was then analyzed through mean, mode and median methods. Miandam valley consists of over 300 plant species. Out of total plant species, 179 are identified so far having medicinal uses (Annexure 1) followed by 33 ethno-veterinary, 29 Vegetables, 28 fodder, 15 wild fruit species, 11 fuelwood, 8 timber, 5 thatching plants, 4 mixing with tea species, 4 for gums and resin, 3 narcotic, 2 ornamental, 2 for decoration/handles making, 2 orchards support, 2 bees attractants, 1 specie avoid milk spoilage, 1 tooth cleaning, 1 as fumigant and 1 for graves sleepers. Majority of these species are either domestically consumed or marketed in the form of its produces. Conservation of species diversity is a matter of international concern. People of the area are using plants for medicinal uses since their abundance/frequency in their vicinities. Analysis of the opinion of the people in relation to international standards (Red Data Book of IUCN threatened species 1998) showed that 27 of the reported species are endangered (Annexure 2), 13 are rare and 10 are vulnerable in the area. Ethno-medicinal uses of endangered medicinal plants of Miandam valley is shown in annexure 2. Extinction of each endangered species from the area could result in eradicating knowledge regarding century's old traditional methods of curing disease from that particular specie. Table 1 gives current status of medicinal plants analyzed through social survey. The results showed that majority of the respondents (91%) favored overall decrease in medicinal plants by almost 25% in the last 3-decades. Moreover, it was also found that in the last 30 years about 60% of the forest area has been deforested. Average rate of deforestation thus calculated in last 30 years is 2%/year. It is assumed that deforestation at this rate would take about 20 more years for complete deforestation of the Miandam valley. 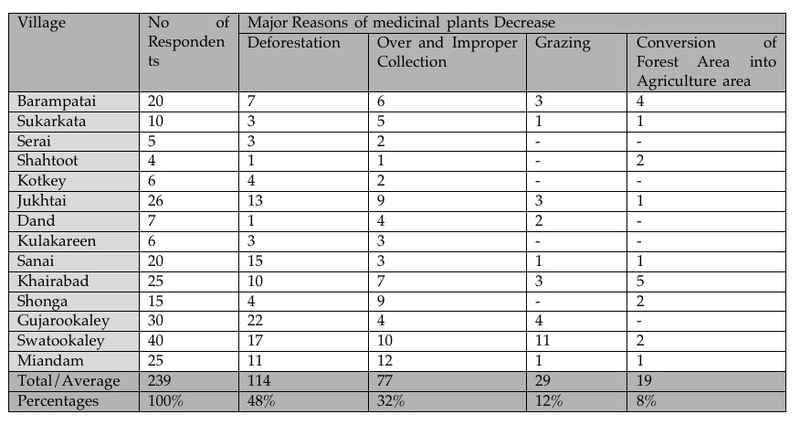 Table 2 below gives a clear idea about major reasons behind medicinal plants decrease. 48% respondents were of the view that deforestation is the major reason behind NTFF decrease followed by 32 % favored over and improper collection, 12% grazing and 8% viewed that medicinal plants decreased due to conversion of forest land to agriculture land. Respondents also indicate some other adverse effects of deforestation that resulted decrease in snow and hence waters in river and springs decreased. Domestic consumption of forest trees at valley's level was estimated as 28680 trees per annum used as fuel wood and houses construction. The preferred timber species are Pinus wallichiana, Abies pindrow, Taxus wallichiana and Picea smithiana. Main commercial uses associated to deforestation are timber and fuel wood selling. About 203,328 cubic feet timber wood equals 877 trees are exporting out each year from the valley. Similarly, an average of 2,828,750 kg fuel wood equals 581 trees are exporting from the whole valley. Data from management plan reveals that Miandam valley consist a growing stock of 120,079 trees with an annual yield or supply of 2,037 trees from all working circles and outside working circles areas. If a tree is considered to have a weight of 4866 kg, height of 25 meter and DBH of 0.6 m then the current domestic and commercial demand of valley are about 8,053 trees per annum. Supply and demand difference is thus calculated as 6,016 trees (75% more than actual supply). It is presumed that in coming 20 years Miandam valley would be completely deforested due to which a lot of ground flora having majority of medicinal plants would be affected badly. This would ultimately leads towards lowering the preferences of local people towards indigenous ethno-medicinal uses. Another factor putting medicinal plants resources on stake is inappropriate and over collection. The people are unaware about proper collection and harvesting technique. Instead of collecting the desired part of the plant they uproot the entire plant thus making it vulnerable for extinction. About 45% losses have been observed in collection, carrying, cleaning, drying, domestic usage, marketing and grading of medicinal plants. Free grazing of livestock is another worth mentioning problems contributes to the overall declining population of medicinal plants. 70% of the village livestock graze freely in summer seasons at upland pastures. Moreover, about 100 nomads each year carry 40,000 goats to pastures for which they pay to the owners of the pastures. They remain there for the summer season starting from March/April to Oct/Nov. This also poses a potential threat to the floral regeneration. Conserving of forest area into agriculture land is one of the most serious problems leading to the loss floral diversity. Data of Swat forest range management plan shows a total of 406 ha of forestland converted into agriculture land. Miandam valley lies in the moist temperate region is stretched over an area of 6,949 ha (1,719 ha agricultural land, 4,388 ha forest area and 842 ha is wasteland). The valley is blessed with a floral diversity of over 300 plant species of which 190 plant species are known for a variety of uses. 179 plant species are being used locally for medicinal purposes as well add significant contribution to local economy in terms of trade. Certain threats are confronting to the existence of medicinal plants that are deforestation, over collection, grazing and conversion of forest land into agriculture area. Medicinal plants have been decreased by 25% in last 30 years for which deforestation has been identified as the major reason. About 8,053 forest trees are deforested each year both for domestic and commercial consumption. Wood consumption statistics of the valley showed that each year almost 75% more trees are cutting than the actual provision from all working circles and out side working circles area. Species decreasing quickly are Pinus wallichiana, Abies pindrow, Taxus wallichiana. With this deforestation rate the stocking could hardly be sustained for the next coming 20 years thus would make happen further substantial decrease in medicinal plant's wild production. Moreover, medicinal plants are free to access everywhere in the wild. The policy is not much effective to conserve them in the wild. It is concluded that ethno-medicinal uses of some important medicinal plant species are under severe threat of extinction that needs proper attention through addressing the above threats and problems. Adnan SM. 2002. Feasibility of Community Involvement in the Sustainable Use of Medicinal Plants in Roringar valley of Swat, Ethnobotany Project, WWF-Pakistan. Ahmad H. 1994. Distribution of Natural Flora in Dist. Swat, Udyana Today 2 (1): 4-6. Ali H. 2003. Trade of Medicinal Herbs in Mingora City. Department of Botany, Govt. Postgraduate College, Bannu. Anonymous. 2000. District Census Report of Swat. Population Census Organization, Statistics Division, Islamabad. GoP. 1999. Operational Plan Miandam Planning Unit, Vol. I, Forest Management Center. GoP. Index Revenue Map, Miandam Patwaar Circle, Khwazakhella, Swat. Mohammad IK. 2002. The Ethnic Factor Behind Deforestation, A Case Study in Swat District, Pakistan: Thesis, International Institute for Aerospace Survey and Earth Sciences, The Netherlands. Latif A, S Begum, M Waseem & SM Adnan. 2004. Medicinal and Other Economic Plants as Substitute to Forest Logging in Miandam and Sulatanr Valleys Swat, Proceeding of International Workshop on Conservation and Sustainable Uses of Medicinal and Aromatic Plants in Pakistan, WWF-Pakistan. Raashid M. 1999. Resource Management Plan for the Swat Forest Range of Swat Forest Division, Forest Management Center, NWFP Forest Department & Inter Cooperation-SDC, Government of Switzerland. Rehman I. 2002. Ethnomedicinal Studies of Miandam Valley, Department of Botany, Government Jahanzeb Post Graduates College, Saidu Sharif Swat, 2002. Shinwari ZK, AA Khan & T Nakaike. 2003. Book on Medicinal and other useful plants of District Swat, Pakistan. Saeeda Y. 2005. Deforestation and Its Impacts on Livelihood Opportunities in Miandam Valley Swat, Ethnobotany Project, WWF-Pakistan. Acacia modesta Wall. Colchicum luteum Baker. Melia azedarach L. Rubus fruticosus Linn. Acacia nilotica Delile, Corydalis govaniana Wall. Mentha longifolia Z.K. Shinwari & M.N. Chaudhri Rumex dentatus L.
Achyranthes aspera L. Corylus jacquemontii Decne. Micromeria biflora Benth. Aconitum violaceum Jacquem. ex Stapf, Cuscuta reflexa Roxb. Morchella conica Pers. Salvia moorcroftiana Wall. ex. Benth. Acorus calamus L. Cynodon dactylon Steud. Morchella elata Fr. Sambucus wightiana Wall. Adhatoda vasica Nees Cynoglossum lanceolatum Heyne, ex Wall. Morchella esculenta L. Sapindus detergens Roxb. Adiantum capillus-veneris L. Cyperus brevifolius Hassk. Morchella ultima Sarcococa saligna Muell. Arg. Adiantum venustum Daphne oleoides Schreb. Myrsine africana L Sesamum indicum L.
Ajuga bracteosa Benth. Datura stramonium L. Nasturtium officinale R.. Br. Sisymbrium irio Linn. Allium cepa Linn. Dioscorea deltoidea Wall. Neolitsea chinensis Chun Skimmia laureola Sieb. & Zucc. ex Walp. Allium sativum Linn. Diospyros lotus Linn. Nepeta govaniana Benth. Solanum nigrum L.
Amaranthus viridis Linn. Dryopteris jaxtaposta christ. Olea ferruginea Royle, Solanum surattense Burm. f.
Arenaria griffithii Boiss. Echinops echinatus Roxb. Onosma hispidum Wall. Solanum xanthocarpum Schrad. & Wendl. Arisaema flavum ( Forssk.) Schott Elaeagnus umbellata Thunb. Otostegia limbata Benth. ex Hook. f. Sonchus asper Wolf. ex DC. Arisaema jacquemontii Blume, Equisetum arvense L. Paeonia emodi Wall. Spiraea chinensis Maxim. Artemisia scoparia Waldst. & Kit. Eruca sativa Mill. Papaver dubium L. Stachys parviflora Benth. Artimisia brevifolia Wall. Euphorbia helioscopia Linn. Periploca aphylla Decne. Stellaria media Cyrill. Atropa acuminata Royle. Ficus palmata Roxb. Pinus wallichiana H. Ohba & M. Suzuki Taxus wallichiana Zucc. Avena sativa Linn. Foeniculum vulgare Mill. Pistacia integerrima Stew. ex Brand. Thymus linearis Benth. Berberis lycium Royle. Fragaria vesca Linn. Plantago lanceolata L. Thymus serpyllum L.
Berginia stracheyi Stein, Geranium wallichianum D. Don, Platanus orientalis L. Tribulus terrestris L.
Gynandriris sisyrinchium Parl. Podophyllum emodi Wall. Trigonella foenum-graecum Linn. Bunium persicum B. Fedstch. Hedera nepalensis K. Koch, Podophyllum hexandrum Royle, Urtica dioica L.
Bupleurum longicaule Wall. Heracleum candicans Wall. Polygonatum aviculare L. Valeriana jatamansi Jones. Butea frondosa Roxb. Hyoscyamus niger L.
Polygonatum multiflorum All. Valeriana wallichii DC. Calotropis procera Dryand. Hypericum perforatum Linn. Polygonatum verticillatum All. Verbascum thapsus L.
Caltha alba Jacquem. Hyssopus officinalis Linn. Polygonum aviculare L Verbena offcinalis L.
Cannabis sativa L. Indigofera heterantha Wall. Portulaca oleracea L. Viburnum grandiflorum Wall. Caralluma edulis Benth. ex Hook. f. Jasminum officinale Linn. Pteridium aquilinum (L) Kuhn. Viola serpens Wall. Carum carvi Linn. Juglans rejia Linn. Punica granatum L. Vitex negundo L.
Cedrus deodara (Roxb. ex Lambert) Juniperus communis Linn. Pyrus pashia Buch.-Ham. ex D. Don, Withania coagulans Dun. Celtis australis Linn. Lathyrus aphaca Linn. Quercus dilatata Lindl. Withania somnifera (L.) Dun. Chamomilla recutita Rauschert. Launaea procumbens Amin Quercus incana Roxb. Zanthoxylum alatum Roxb. Chenopodium album L. Lepidium sativum L. Rheum australe D.Don, Zanthoxylum armatum DC. Chenopodium botrys L. Lotus corniculatus L. Rhus semialata Murr. Ziziphus sativa Gaertn. Cichorum intybus L. Male fern Ricinus communis L. Zizyphus mauritiana Lam. Citrullus colocynthis Schrad. Mallotus philippensis Karst. Rosa moschata Benth. Zizyphus vulgaris Lam. Colchicum autumnale L. Melia azedarach L. Rubia cordifolia Hochst. ex A. Rich. 15 Podophyllum emodi Wall. Berberidaceae Kakora The powdered rhizome with some other plants is used to control jaundice and other liver disease. 16 Podophyllum hexandrum Royle, Berberidaceae Kakora The powdered rhizome with some other plants is used to control jaundice and other liver disease. 23 Skimmia laureola Sieb. & Zucc. ex Walp. Rutaceae Nazar Panra Its leaves are burnt as incense and to expel evils and evil eyes. Tea made from the leaves used for dyspepsia, smoke used as antiseptic. 26 Valeriana jatamansi Jones. Valerianaceae Mushk-e-Bala Unknown local uses, it is sold in the drug market for preparation of some anti spasmodic and carminative drugs.